Healthy aging starts with living a healthy lifestyle. What is a healthy lifestyle? It is one that slows down the oxidation that will cause our eventual destruction. We are mortal; that is not news. Oxidation is defined chemically as the transfer of electrons, where one thing gains one, and the other loses one. Free radicals are unstable molecules with an unpaired electron. Free radicals will steal an electron from proteins, cell membranes or other structures in order to become stable. These free radicals cause damage to the body as they steal electrons via oxidation (the transfer of electrons). The marker for this damage is inflammation, a vital part of the body’s immune response. Acutely it works to heal wounds and defend the body against foreign invaders (viruses, bacteria), yet when it is chronic, inflammation plays a role in EVERY chronic disease. It is not, in fact, the inflammation itself that is the problem, rather the constant state of destruction by free radicals that inflammation flags. Living a clean, non-inflammatory lifestyle would allow us to live much longer than we do, to live the 120+/- years we were designed to live. However, when we inundate ourselves with oxidative triggers that cause free radicals, our innate anti-inflammation systems have no chance, and we last little more than 1/2 that time. The things we all know affect our health: diet, exercise, smoking, hydration, and sleep, to name a few, should be maximized, as they all impact inflammation by either increasing or decreasing free radical formation and damage, depending on the decisions we make. It is documented that associations with inflammation and age-related illnesses exist. In fact, as stated above, all chronic diseases are linked to chronic inflammation signifying free radical damage. “If the major risk factors of chronic disease were eliminated, at least 80% of all heart disease, stroke, and type 2 diabetes would be prevented; over 40% of cancer would be prevented according to a study from the Centers for Disease Control and Prevention (CDC); May 1, 2014. Regarding obesity, many already know not having obesity is more healthy than having it. But why? Because fat cells call in inflammatory cells and give them what to “clean up”. So, fatty tissue is inflammation factories. No wonder so many chronic diseases are associated with it, and it is much more healthy to not have obesity. The explanation used to be because obesity is unhealthy; however, the current explanation goes right back to inflammation. Stress is also linked to inflammation, it is the mechanism by which it exacerbates coronary disease, for example. Smoking causes cancer through inflammation. It is the link by which most, if not all, cancer is produced. The key to healthy aging? Reduce inflammation (oxidative damage) by every lifestyle means one can. First Choice Nutrition & Wellness is a division of First Choice Neurology managed by Eileen Higgins, MD, FACS. 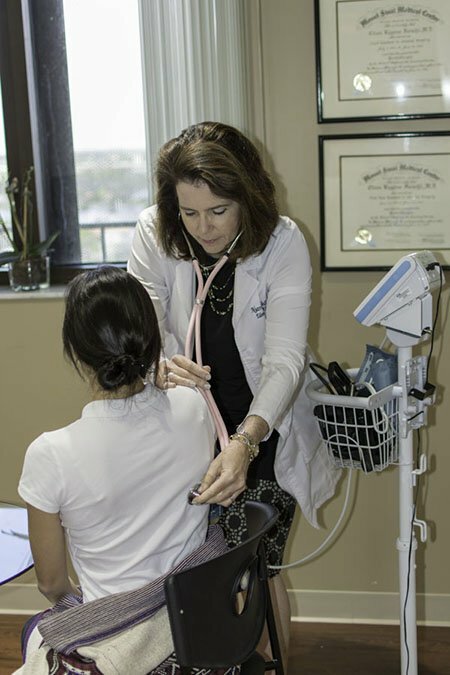 She educates her patients and provides personalized, custom plans aimed at controlling and reversing specific disease processes, weight loss and promoting a healthy lifestyle in general. You can contact Eileen Higgins, MD, FACS at First Choice Nutrition and Wellness located at 8940 N. Kendall Drive, Suite 802E, Miami, Florida 33176. Call (305) 595-4041 ext. 2225 to schedule an appointment.